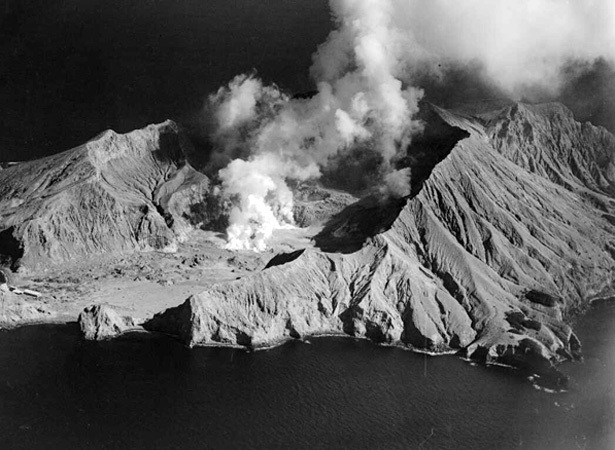 Attempts were first made to mine sulfur on White Island around the beginning of the 20th century. On 10 September 1914, 10 miners were killed when part of the crater wall collapsed, causing a landslide. The only survivor was the mining company’s cat, Peter the Great. Sulfur was used in the manufacture of sulphuric acid and superphosphate fertiliser. White Island, in the Bay of Plenty 50 km from Whakatāne and Ōpōtiki, is New Zealand’s most active volcano. Known to Māori as Whakaari (‘to uplift or expose to view’), it is important to the local iwi, Ngāti Awa and Te Whakatōhea. Sulfur mining on White Island recommenced in the late 1920s but proved uneconomic and ceased in the early 1930s. A total of 11,000 tonnes had been obtained. Today the island is a privately owned scenic reserve and tourism venture. We have 8 articles, related to Eruption on White Island kills 10 people.